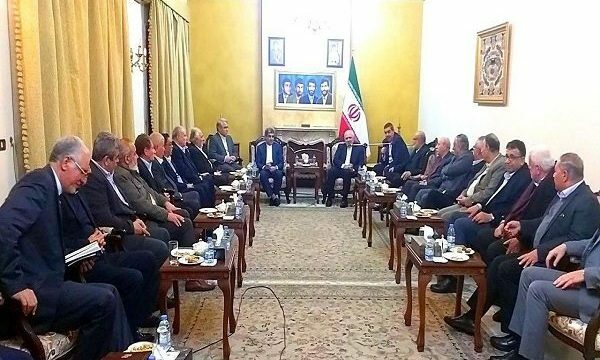 MNA – Iranian Foreign Minister Mohammad Javad Zarif on Sunday held talks with representatives of political parties and movements in Beirut. According to the website of Iranian foreign Ministry, in the meeting, Zarif expressed satisfaction with his visit to Lebanon on the eve of the 40th anniversary of the Islamic Revolution which marks the resistance of Iranian people against the hostility of great powers. “It is an honour for us that we have always stood with the nations of the region, especially the Lebanese people. We are standing with the Lebanese people and are ready to expand our cooperation in various fields of mutual interest,” the foreign minister added. In this meeting, representatives of Lebanese political parties and movements congratulated Iran on the 40th anniversary of the victory of the Islamic Revolution and expressed their views on the situation in Lebanon and the region and ways to expand ties between the two countries. Heading a high-ranking delegation, the Iranian foreign minister arrived in Beirut on Sunday for a two-day visit to hold meetings with Lebanese officials.